TheForce.Net - Video Games - Star Wars: The Old Republic Has Arrived! Star Wars: The Old Republic Has Arrived! So I wonder how many people took off work in celebration of today's highly anticipated release of Star Wars: The Old Republic. 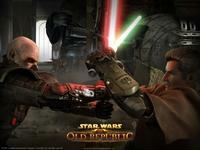 Yes, The Old Republic has officially launched in North American and European Territories. SWTOR.com is celebrating the release by presenting the "Your Saga Begins" launch documentary video as well as by reminding fans that it's not too late to give the gift of TOR this holiday season. Press for the release of Star Wars: The Old Republic will undoubtedly snowball as the day progresses. For now, USAToday.com proclaims that the "Star Wars universe is getting a lot bigger," Ars Technica has a new preview that explores the game's single-player potential, and Kotaku.com says that you should definitely purchase the newly released MMO. UPDATE: As launch day continues, The Old Republic has received a lot more coverage. We'll continue adding article links as the day progresses. Worried about BioWare's server queues? Kotaku tells you how to avoid waiting to play. The Detroit News reports on the plethora of vocal talent needed to bring the game to life in players' ears. CNN's Geek Out blog talked to the game's lead writer, Daniel Erickson, about how BioWare created an authentic Star Wars experience for fans of all types. Widescreen Warrior presents ten tips for people who are about to jump into the game. Forbes presents images of The 501st Legion storming Times Square in New York City to promote the game's release. Boston.com writes, "Unlike most other persistent multiplayer games, "Old Republic" is relying more on voices than written words to push its narrative forward with an unprecedented amount of spoken dialogue." Mashable.com presents a TOR Q&A with BioWare founders Dr. Greg Zeschuk and Dr. Ray Muzyka. "Star Wars: The Old Republic's scope is dizzying" declares WashingtonPost.com. So, how many people are actually playing the game at this point? Stuff.co.nz reports approximately 1.5 million. The Wall Street Journal examines the numbers in EA's new MMO venture against Activision Blizzard's World of Warcraft. Will the "universal appeal" of TOR lead to it's success? AllThingsD.com considers this in their preview. Kotaku.com reports that you probrably shouldn't be holding your breath for The Old Republic to make the shift to free-to-play mode anytime soon. If you are considering purchasing SWTOR on Origin, FleshEatingZipper.com urges caution. Below you will find the TOR launch press release, a preview from the one and only Warwick Davis, and a refresher of the cinematic trailers that made the Star Wars community take notice of this brand new GFFA experience. REDWOOD CITY, Calif ? December 20, 2011 ? A stunning Star Wars universe. Thousands of hours of gameplay. Gripping stories. Engrossing dialogue performed by hundreds of talented voice actors. BioWare, a label of Electronic Arts Inc. (NASDAQ: EA), today is proud to turn on the servers for one of the most anticipated games of all time, Star Wars: The Old Republic, winner of over 100 awards from critics around the world. Last night, fans lined up around the block on the eve of launch at retail outlets in New York, Paris, London, Austin and other cities across the world, celebrating the debut of the game with gatherings complete with costumed characters and memorabilia giveaways. This morning, EA, BioWare and LucasArts continue the launch celebration by hosting the opening ceremony and ringing the bell at the NASDAQ stock exchange. The ceremony can be viewed at http://nasdaq.com. As the servers go live and fans flood into the game, BioWare customer support teams are managing the network infrastructure to ensure every player has a smooth, easy and fun experience getting into the game. ?Today represents an amazing milestone for BioWare, EA and Star Wars fans everywhere and we are confident it has been worth the wait,? said Dr. Ray Muzyka, Co-Founder, BioWare and General Manager, EA?s BioWare Label. ?The support and resources going into Star Wars: The Old Republic are not ending today. The innovations we?re bringing to the category are just the start of a journey and ongoing investment in our players that will grow, evolve and transform based on player feedback over the weeks, months and years ahead.? Dr. Greg Zeschuk, Co-Founder, BioWare and General Manager of the BioWare Label?s MMO Business Unit, added: ?The addition of story and personal choice to the MMO genre is going to fundamentally change the way people perceive MMOs moving forward, especially when it is experienced at its fullest potential with high-quality writing and voice acting. We are extremely happy with where The Old Republic stands at launch and we can?t wait to grow the game with our community to make it even better in the future.? *Subscription pricing in the United Kingdom will be ?8.99 per month, ?25.17 for three months (?8.39 per month) or ?46.14 for six months (?7.69 per month). Subscription pricing in Europe will be ?12.99 per month, ?35.97 for three months (?11.99 per month) or ?65.94 for six months (?10.99 per month). The BioWare Label is a division of EA which crafts high quality multiplatform role-playing, MMO, social, play-for-free and strategy games, focused on emotionally engaging, rich stories with unforgettable characters and vast worlds to discover. Since 1995, BioWare has created some of the world's most critically acclaimed titles and franchises, including Baldur's Gate?, Neverwinter Nights?, Star Wars? : Knights of the Old Republic?, Jade Empire?, Mass Effect? and Dragon Age?. BioWare currently operates in eight locations across the world, including Edmonton (Alberta, Canada), Montreal (Quebec, Canada), Austin (Texas), Fairfax (Virginia), San Francisco (California), Los Angeles (California), Sacramento (California) and Galway (Ireland). In 2008, BioWare was acquired by Electronic Arts, a leading global interactive entertainment publisher. In 2011 EA created the BioWare Label, alongside EA Games, EA SPORTS? and EA Play. For more information on BioWare, visit www.bioware.com, or follow us on Twitter at www.twitter.com/bioware. To join the millions of fans already registered with the BioWare community, go to http://social.bioware.com. Electronic Arts (NASDAQ:EA) is a global leader in digital interactive entertainment. The Company?s game franchises are offered as both packaged goods products and online services delivered through Internet-connected consoles, personal computers, mobile phones and tablets. EA has more than 100 million registered players and operates in 75 countries. In fiscal 2011, EA posted GAAP net revenue of $3.6 billion. Headquartered in Redwood City, California, EA is recognized for critically acclaimed, high-quality blockbuster franchises such as The Sims?, Madden NFL, FIFA Soccer, Need for Speed?, Battlefield, and Mass Effect?. More information about EA is available at http://info.ea.com. LucasArts, the LucasArts logo, STAR WARS and related properties are trademarks in the United States and/or in other countries of Lucasfilm Ltd. and/or its affiliates. ? 2011 Lucasfilm Entertainment Company Ltd. or Lucasfilm Ltd. All rights reserved. BioWare and the BioWare logo are trademarks of EA International (Studio and Publishing) Ltd. EA and the EA logo are trademarks of Electronic Arts Inc. All other trademarks are the property of their respective owners.